SINGAPORE - An electric scooter went up in flames at a Pasir Ris block on Wednesday (Nov 8), just one day after a similar fire landed a family in the hospital, with one member still in the intensive care unit with second-degree burns. Wednesday’s incident occurred at about 6.30am in Block 548, Pasir Ris Street 51. It involved the contents of a balcony, and there were no injuries, said the Singapore Civil Defence Force (SCDF). In Tuesday’s incident, however, Mr Ridwan Ithnin, 23, suffered burns to 45 per cent of his body, and had to be saved by his neighbour from the window ledge of his 10th-floor Yishun flat when the e-scooter exploded in his room. 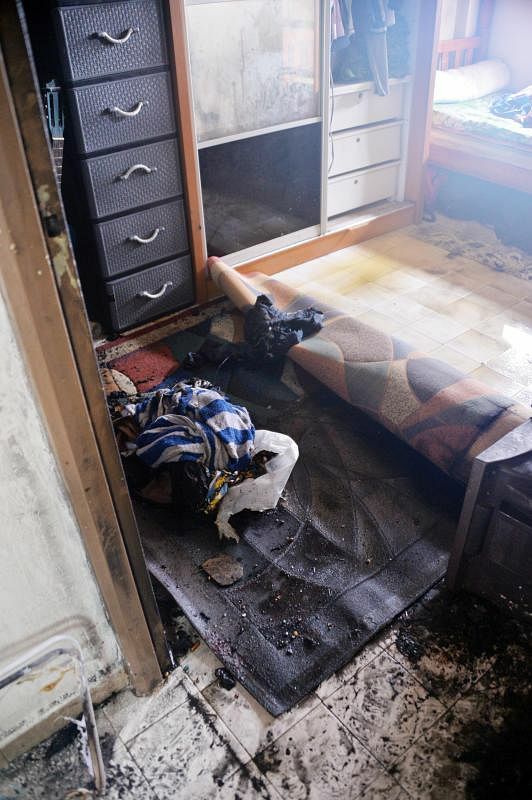 The flames blocked the door, leading him to break open his window and climb out in a panic. The two latest incidents bring the tally of fires caused by personal mobility devices this year to at least 33. The SCDF said there were 31 fires involving personal mobility devices – now widely used – from January to September this year, compared to 19 cases over the same period last year. Mr Ridwan had bought the e-scooter just two weeks ago for his part-time job as a deliveryman for Deliveroo, his brother, shipping engineer Kamil Ithnin, 31, told The Straits Times. Mr Kamil said that his brother had charged the e-scooter for about six hours before it exploded. “I was at a meeting when the fire broke out. When I reached home, I saw my brother at the foot of the block on a stretcher,” he said. He added that his father, who tried to put out the fire, and sister-in-law were also hospitalised for smoke inhalation. Mr Kamil said he cannot thank his neighbour, Mr Guyrence Tan, 26, an undergraduate at Lasalle College of the Arts, enough. Mr Tan had dashed into the bedroom to pull his brother from the ledge, suffering burns on his hands in the process. “I need to treat his whole family to makan,” he said. Mr Tan’s mother, who declined to give her name, said her daughter had called to tell her that her son had dashed into a fire to save someone, but did not initially mention that he was hurt. “But I felt uneasy after hanging up the call, so I called back and that was when he told me they were going to the hospital,” said the volunteer worker. The two families have known each other for at least 10 years. Mr Tan had just woken up when he heard people shouting “hold on”. He ran into the bedroom to help when he saw that Mr Ridwan was on the ledge. He is now recovering from his injuries at home, his mother said. “I told him that I’m proud of what he did, but also reminded him to be mindful of his own safety,” she said. Last month, a family had to escape through their bedroom window with a five-day-old baby after an electric bicycle charging overnight in the common corridor of a Bukit Batok block caught fire. Nanyang Technological University’s Energy Research Institute executive director, Professor Subodh Mhaisalkar, said getting to the root cause of battery fires is a complicated process. But he noted that the industry is well able to produce safe batteries. “Why such cases still happen is because there is insufficient care taken in certification and verification of design...it could be possible that the device did not go through all the safety checks or that there was a manufacturing defect,” he said. Whatever the root cause, Mr Kamil has sworn off e-scooters.